Are you ready for one of the biggest Rock shows of the entire year! 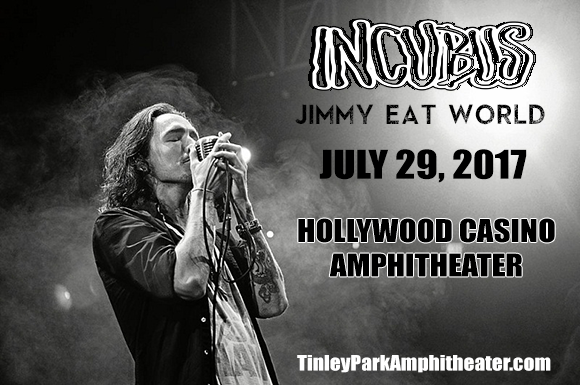 The rumors have confirmed to be true – the exciting news of Incubus & Jimmy Eat World's 8 date tour… For any fan of either one of the bands, this will be an night to never forget, full of crowd chanting and live performances of your favorite songs. Catch it all as they both stop off at Hollywood Casino Amphitheatre on Saturday 29th July 2017! Tickets are bound to sell fast – book yours here!! Incubus showcase all of the best parts of the 1990's through their career in Alternative Rock. As part of the biggest movement of that decade, they hit the ball rolling and later would combine elements of other genre's to really make their mark on music history. Their unique sound is made up of; art rock, heavy metal, electro, funk, funk metal, jazz and even hip hop! Their Californian roots also have had a huge impact on shaping their sound, particularly in songs such as "Are You In?" Fast forward to more than 20 years since their beginning, Incubus continue to hold multi-platinum status. And 2017 will undoubtedly bring even more success as they release their newest album, since their last back in 2011. Join them as they hit a stadium near you!